We propose a rich choice of dog muzzles for various dog breeds. The special feature of our dog muzzles are special design according to dog breed snout shape and size, handmade craftmanship, rich experience and the best materials. 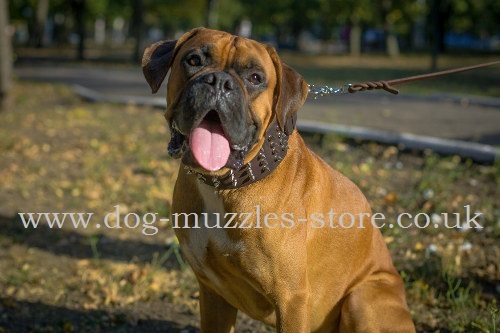 Choose Boxer dog muzzles of the best quality and price from the producer directly. Boxer dog breed is one of the most popular and favorite dog breeds in the Great Britain. We propose premium quality dog accessories for comfort and safety of your doggies daily. Boxer is a strong, muscular, and very energetic dog breed. This is one of the most enduring and strong dog breeds in the world. For these qualities Boxer often works as a police, service or a guard dog. Boxer dogs are very popular, especially with families that have kids. Probably this dog breed is called like that because of its strange habit. Boxer dogs fight with their front legs like boxers. Boxer dogs have a distant relation to the Rottweiler dog breed. Boxer’s primogenitors hunted wild boars, deer, and even bears. Because of their clamp-like bite and a huge head with a wide snout our hunter could easily hang by the prey not closing the teeth for a long time. However, the same fierce dog could turn into a peaceful shepherd for guarding cattle. Hunting dogs were raised in all parts of Europe till the 18th century. For example, on the territory of Germany there were two kinds of them. Large individuals were called Bullenbeiser, and smaller ones Brabantine. The latter became a prototype of a modern Boxer dog. The word “bullenbeiser” is translated as a bull biter. All hunting dogs of the country were called like this, however they differed a lot by their color and appearance. You can find such a stuffed dog in St. Petersburg’s cabinet of curiosities. Even a person with a well-developed imagination can guess that it’s a Boxer’s ancestor. Boxers have a universal blood group, which does for all dog breeds. A usual Boxer’s appearance started to form in the 18-th century. One-color red or striped dogs without white spots had short and wide snouts as their ancestors. Upper jaw was shorter than a lower one, so a dog could hold a prey and breathe at the same time. At that time people already docked hunting dog’s tails and ears, as they were the most vulnerable part of body. These bullenbeisers took part in hunting. They usually were lying-in-wait, and when tracking dogs drove out wild animals, they rushed at the prey with all the lead. Such a dog should hold the prey until the owner comes and finishes it off. That’s why centuries-old boxer breed selection was oriented on development of these working characteristics. A new variation of bullenbeiser received a name “boxer”. Some individual had a distinct feature - a groove on the nose. Sometimes it was so deep that it seemed that a nose was divided into two parts. Such dogs were called “double-nosed” and were reckoned among true boxers. One of the most famous owners of this breed was a Bavarian robber Matias Klostermann. There are lots of engravings depicting him with his favourite dog. For sure such a dog created a stunning impression. In 1771 Matias and his gang commited a famous robbery in Dillingen. Boxer’s ancestors appeared also on the Russian artists’ pictures. For example, Bryullov depicted princess Golitsina together with her Brabantine bullenbeiser. With the appearance of firearms, public hunting with dogs was forbidden by the government, and hunting dogs retired. Butchers and cattle trader became interested in the Boxer dog breed, and we can say they save this dog breed. A fighter turned into a shepherd and a guard. To improve working characteristics of the dogs, that changed their qualification, Boxer dog breeders started to combine them with English Bulldogs. Boxers got wide body and large short head, as well as white spots on the fur from English Bulldogs. Unfortunately, these dogs were neglected till the end of the 19-th century, as they were just service dogs of German traders. When in 1893 there was a suggestion to add bullenbeisers to the herd-book, other dogs’ breeders were outraged. Boxer’s defender was a competent trainer Friedrich Robert, who had already dealt with these dogs. His experience showed that the Boxer dog breed performed many tasks better, than other hunting dogs recognized by society. As a result, Boxer dogs were admitted to the participation in exhibitions in 1985. Then the German Boxer Club was founded with the assistance of Robert. One year later the first German exhibition took place, 50 dog of various colors and appearance were presented there. Some presented dogs had wolf-like snout, others looked like bulldogs. So, the standard changed, and not even one time. At the turn of the century the Boxer dog breed was added to the herd-book. This dog became so popular in Germany, that it exceled in amount other dog breeds on the exhibitions. Boxer selection approaches changed. Before breeders were interested more in dogs’ working characteristics. Now real artists got down to business. In 1910 Stockman family presented to the public a sculpture of an ideal future Boxer dog. The creator of this image was lady Friderum Stockman. One year later this lady opened a private farm “Fon House” together with her husband to make the ideas about boxer dogs come true. The family faced many obstacles on the way to their goal. At the beginning of the first world war Philipp went to the army, and lady Friderum was left alone with the baby, and the whole farm. Fortunately, she went through two wars and avoided bankruptcy. What is more, she succeeded in creating a kind of modern Boxer dogs. As a rule, German boxers have bobtails. Boxer was bred in Germany crossing German and English Bulldogs in 1850. First, boxers were used as fight dogs and for baiting bulls. But with the flow of time its aggressive characteristics were removed. Nowadays, Boxer is an ideal family dog. They are kind and playful. They love children. Therefore, a baby should be careful with young excited dog that can by accident knock a child down. This dog breed need heavy sports exercises. They may live in a flat, but they need physical training two times a day. Otherwise their energy may be used in the wrong way. German Boxer is sensitive to heat, that’s why it’s better to avoid intensive exercises in hot weather. Representatives of this dog breed are smaller than their Rottweiler relatives, but they look very impressive. Strong skeleton and developed muscles give Boxer’s body square shape. You can feel strength and nobleness in his every energetic movement. Boxer’s head shape reminds of their ancestors that took part in wild animals hunting. Lower jaw comes 1,5 cm forward. Flashy lips hang down on the sides. Nose is a little flat. At the beginning of breed formation Boxer’s tail and ears were cut off. Still, when hunting was abolished, the tradition didn’t change. It seemed that after these manipulations a dog looked more elegant. In 2002 in many European countries this operation was banned. So, the dog breed standard was changed again. However, acceptable color didn’t change for many years. A boxer may have a striped, or red fur with black mask. White spots are acceptable when they occupy less than 30% of the dog’s body. There are a lot of arguments about boxers albinos. White color isn’t included to the standard. Boxer dogs have very strong nervous system, complaisant character, and lively temperament. Boxers treat all the family members very well, contacts with them, and enjoys owner’s attention. At home this dog is very calm, but it likes to have fun outside. Frequent physical exercises are obligatory conditions for keeping a Boxer dog. These energetic dogs love long walks. Their curiosity doesn’t give Boxers a moment’s rest. Exploring the territory, Boxer will sniff around and puff in a funny way. But it will not go too far. The owner is the most important for this dog, as he is a friend with whom Boxer can share its joy. Boxers tend to be cocky. They can get on well with cats in their flat, but will be aggressive to cats outside. Boxers are watchful to strangers. This dog breed has all the qualities of a fighter – strength, dexterity, courage. It means that a well-planned training will turn a boxer into a great guard dog. At the same time Boxers have some childish sincerity and amazing sensitiveness. Since early years this dog prefers to get desirable with the help of humour and charm, and not with aggression. A dog will quickly understand from whom of the family members it can swindle a treat. So you should be successive in its educating. It’s better to agree about prohibitions at once. Boxers are good dogs for beginners, who is going to take his first dog. Boxer dogs need a lot of your attention, but they are unpretentious in care. Short fur doesn’t get tangled, that’s why you don’t need to comb it. The same is with fur cleaning. If a dog got dirty during the walking, you can clean it with warm water. Pay special attention to dog’s eyes. Keep ready a soft handkerchief to remove dust, grass seeds, and lacrimal secretion from eyes corners. Ask a vet to prescribe a soothing ointment, which you will use for dog’s eyelids in case of redness, even when it’s a slight one. Boxers have a good appetite, which can result in obesity. That’s why try to regulate pet’s meals and do not treat it with pieces from the table. Remember that with the appearance of food, this dog breed has an abundant salivation. A dog of the Boxer dog breed is a wonderful companion for a big family, responsive and playful friend, and what’s more – a real service dog. Boxer dogs can’t stand loneliness. They need long walks and games. But, you should believe that it is worth your energy and spent time. It is a truly wise dog that shares its joy with everybody demanding nothing in return.